“`Actress Dorothy Malone was best familiar to 1960s television viewers as Constance Mackenzie, the long-suffering mother of Mia Farrow, in the night-time soap Peyton Place. She also won an Oscar for her work in Written on the Wind. After 11 years of roles playing sweethearts and wives, the brunette actress decided she needed to gamble on her career. She fired her agent, hired a publicist, dyed her hair blonde and sought a sultry image, which led to her award-winning performance. “`In 1942, an RKO talent scout saw her on stage at Southern Methodist University, and recommended her for a film contract. Moving to Warner Brothers in 1945 gave her a great opportunity. In her first film at the studio, The Big Sleep, she was cast as a bookshop clerk opposite Humphrey Bogart. “`She took on roles in Night and Day, Colorado Territory, Artists and Models, and Battle Cry. During the 1950s, she thrived in biopics, Man of a Thousand Faces and Too Much Too Soon, the scripted tales of Lon Chaney and John Barrymore (working with James Cagney and Errol Flynn). “`Malone thrived on television guest-starring in Route 66, Dr. Kildare, The Untouchables, Ellery Queen, Ironside, and Vega$. She also had a prominent role in the mini-series, Rich Man Poor Man. Her final big screen part was in Basic Instinct. Dorothy got the latter part, after impressing Michael Douglas on an episode of The Streets of San Francisco, a decade before. They remained friends after her appearance. “`Malone’s enduring connection to Peyton Place led to co-starring in two made-for-television movies: Murder in Peyton Place and Peyton Place – The Next Generation. 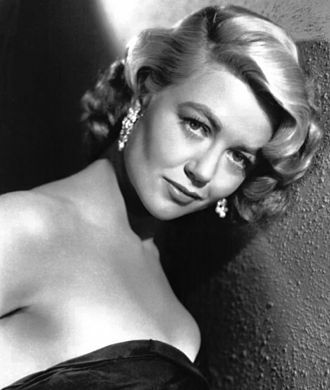 “`A lingering memory to Hollywood’s Golden Age, Dorothy Malone (above) was 93. This entry was posted on Saturday, January 20th, 2018 at 2:44 pm	and is filed under Blog by Manny Pacheco. You can follow any comments to this post through the RSS 2.0 feed. Responses are currently closed, but you can trackback from your own site.